It’s not often that blue whales are encountered in early March off Monterey, and the lone blue whale spotted Monday morning almost certainly wished it could have been elsewhere. That’s because six transient killer whales were in the mood to harass larger cetaceans, and the accompanying footage shows what experts believe is a blue whale reacting to a killer whale bite to the fluke, or tail fin, by throwing its fluke into the air. This type of interaction is extremely rare and the footage might be the first documentation of killer whales physically harassing a blue whale off California. The sighting occurred before noon aboard the Sea Wolf II out of Monterey Bay Whale Watch. The top image, captured by Daniel Bianchetta, shows blood on the blue whale fluke. The second image reveals that part of the fluke is missing. Moments after this episode the blue whale fled and was not pursued by the orcas. Alisa Schulman-Janiger, a California-based killer whale researcher, said that although the killer whales were underwater and not visible during the tail-slapping event, it was clear that this was a physical confrontation, and that the blue whale had just been bitten. "The blue whale takes off like a bat out of hell, and there's blood on its tail. That's an interaction," she said. The Sea Wolf II was captained by John Mayer. Mike Merlo, the co-captain, captured the video footage. 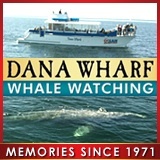 Monterey Bay Whale Watch is owned by Nancy Black, a prominent killer whale researcher, who was not aboard during the encounter. There are additional clips and photos on the company Facebook page. The crew described the blue whale's actions as "freaking out." Transient killer whales are known to attack much smaller gray whales, especially mothers and calves. Gray whales are beginning to migrate from Baja California nursing grounds to Arctic home waters, but it'll be a few weeks until cow-calf pairs begin to pass Monterey. Killer whales ambush gray whales as they traverse Monterey Bay's deep submarine canyon. Blue whales, the largest mammals ever to have inhabited the planet, typically show up off Monterey and Southern California in late spring or early summer.